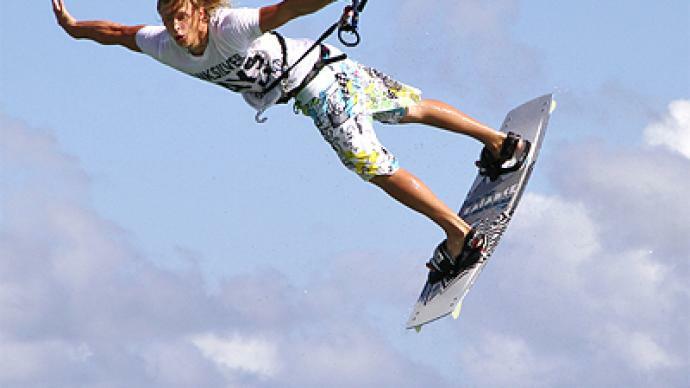 One of the world’s best kite surfer’s attempt to cross the Gulf of Finland is on hold. Russia’s Pyotr Tyushkevich was due to surf all the way from Tallinn to Helsinki, but was forced to postpone his bid due to a lack of wind. Pyotr Tyushkevich may already have been crowned world champion, but the task of trying to surf all the way from Tallinn to Helsinki presents its own problems, such as navigating the sea currents and trying to make sure the wind does not blow him too far off course. He had plenty of support – even his parents were present, having made the short journey from their home in St. Petersburg. The weather conditions looked perfect with the sun shining and the temperature hovering around the 25-degree-Celsius mark. However, unlike the previous couple of days, there was a distinct lack of wind. It was evident from his first attempt, that trying to cross the 80 kilometer distance was going to be a tall order, as there was just not enough wind. Pyotr spent around ten minutes in the water before having to return to shore. He was philosophical, knowing that the elements are beyond his control, and his attempt to become the first Russian to cross the Gulf of Finland by kite will have to be put on hold for a few days more yet.